Our Special Event Services & Amenities include: - Indoor and outdoor banquet facilities - Private dining and meeting room - Professional on-site catering services - Variety of special event packages or customized packages - Affordable room rental rates - Food and beverage pricing customized to fit any budget - Convenient location between Mobile and Gulf Shores - Audiovisual technology available - Wi-Fi Internet - Fully-stocked bar, ample parking and more! We have the capabilities to handle small to large groups in a wide range of settings, from intimate rehearsal dinners, bridal luncheons and sophisticated indoor/outdoor wedding receptions to outdoor barbecues, business meetings and private dinner parties. Follow the Special Events link to view our Wedding & Events Guide. This space features a huge vaulted ceiling with a skylight. The large bay doors open to a magnificent view of the rolling hills of the gofl course. This room is heated and cooled, and can seat up to 150 guests. This room is perfect for a larger conference, meeting, or cocktail party, Christmas party, or soiree. Enjoy a beautiful outdoor wedding on our driving range! The Main Dining Room can seat up to 100 guests. 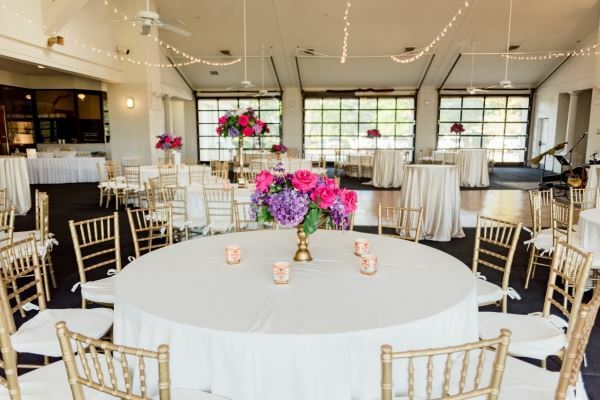 This is a more formal room and is a charming choice for your event. It features a fully stocked bar, tables and chairs, a TV, and access to the Private Dining Room and the Breezeway. The Private Dining Room is a great space for a group of up to 30. The room has gorgeous veiws of the course and a wrap-around patio connected to the space. The room has a credenze for presentation materials, food, or whatever else you may need it for. This room can be setup however you'd like.